Top quality products to ensure reliability and high performance to any application that take advantage of compressed air or water storage. 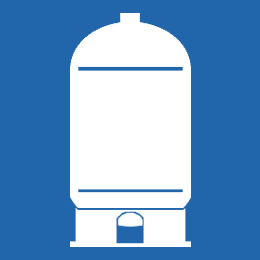 Small to medium sized all-purpose cylindrical pressure storage tanks in compliance with European Pressure Equipment Directive (PED). Ideal to be used in food and beverage processing, chemical processing equipments, oil refinery plants, machinery and automation, compressed air storage, steam accumulation, heat recovery systems, shipbuilding and automotive. Stainless steel has a high resistance to corrosion, it is safe to use in contact with drinking water or food. 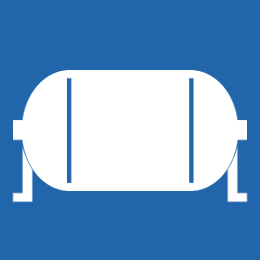 Cylindrical pressure vessels for water or air storage made in stainless steel. Diameter from 88 to 700mm, height from 200 to 2000mm, capacity from 1 to 730 litres, unrefined steel finish. Supplied with welded 1/2" or 1" stainless steel pipe sleeves at the center of both caps, 1/4" or 3/4" welded pipe sleeves and holes on the tank body. Upon request we can customize layout and type of connections and fittings to suit every need. Horizontal-mounting pressure storage reservoirs with detachable L-shaped brackets, all made in stainless steel. The brackets are fixed to the sleeves placed at the cap center with M1/4" - F1/4" reducer bushings. Diameters from 88 to 245mm, capacity from 1 to 24 litres, unrefined steel finish. Supplied with welded 1/2” stainless steel pipe sleeves at the center of both caps, 1/4” pipe sleeves welded to the tank body. Custom-designed brackets and fittings to meet any requirement on request. 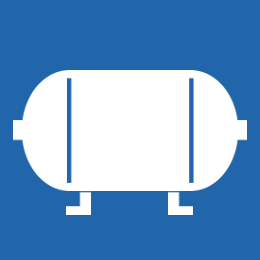 Horizontal-mounting cylindrical pressure storage containers with brackets welded to the tank body. Diameters from 130 to 700mm, height from 100 to 2000mm, capacity from 1 to 730 litres. Unrefined steel finish, brackets with slotted holes. Supplied with welded 1/2” or 1” stainless steel pipe sleeves at the center of both caps, 1/4” or 3/4” welded pipe sleeves and holes on the tank body. Tailor-made brackets and customized connections and fittings on request. 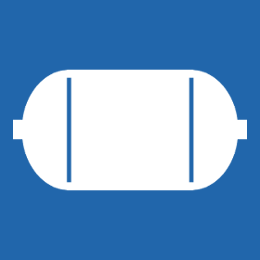 Vertical-mounting pressure vessels for air and water. Attached stainless steel base ring with inspection holes. Diameters from 160 to 700mm, capacity from 4 to 730 litres, unrefined steel finish. Supplied with welded 1/2” or 1” stainless steel pipe sleeves at the center of both caps, 1/4” or 3/4” welded pipe sleeves and holes on the tank body. Bespoke base, connections and fittings according to customers need.